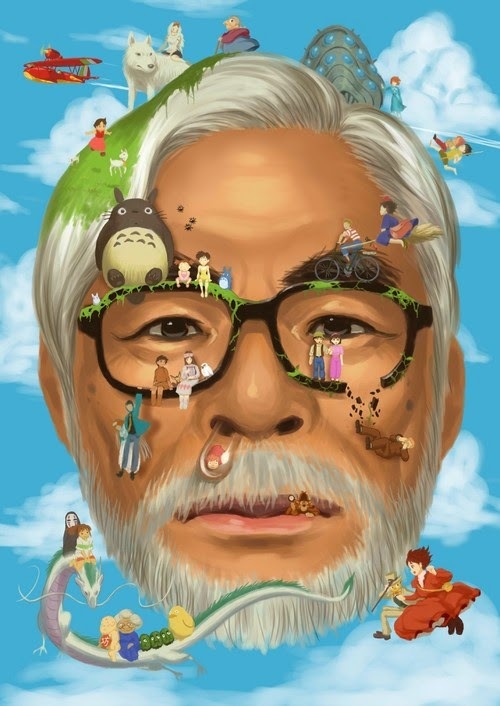 While he's not exactly a household name outside of Japan, Hayao Miyazaki is known everywhere by animation fans. His list of stellar animation feature films reads like a highlights reel of Japanese anime, which in large part because of him has been in the forefront of world animation since the 1960s: "My Neighbor Totoro," "Kiki's Delivery Service," "Princess Mononoke," "The Cat Returns," "Spirited Away" (won the Oscar for Best Animated Feature). the list goes on and on. 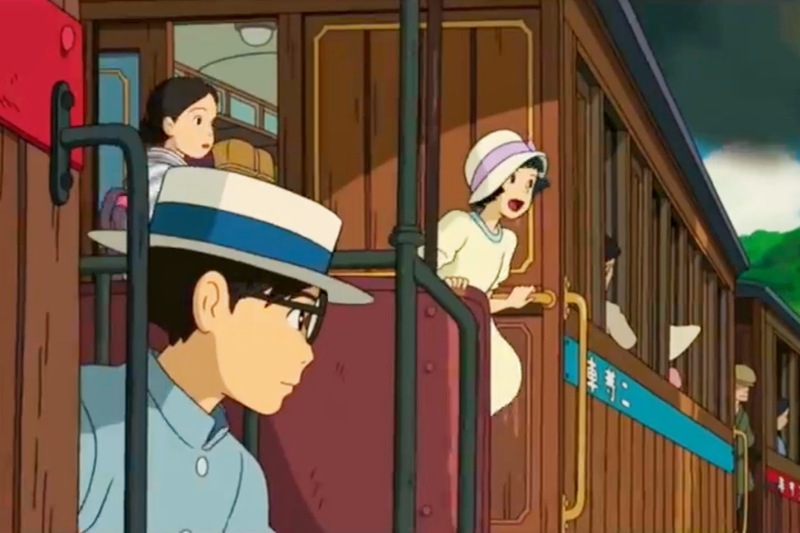 While he has the reputation within Japan of embodying a Western orientation, in fact Miyazaki is Japanese through and through, always displaying a distinctive Asian style. 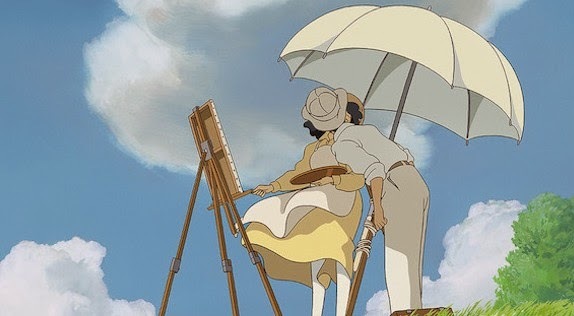 In "The Wind Rises" (2013), written and directed by Miyazaki, he proves it, and in the process creates a lyrical (and controversial) homage to a man's - and a nation's - wildest dreams and deepest horrors. 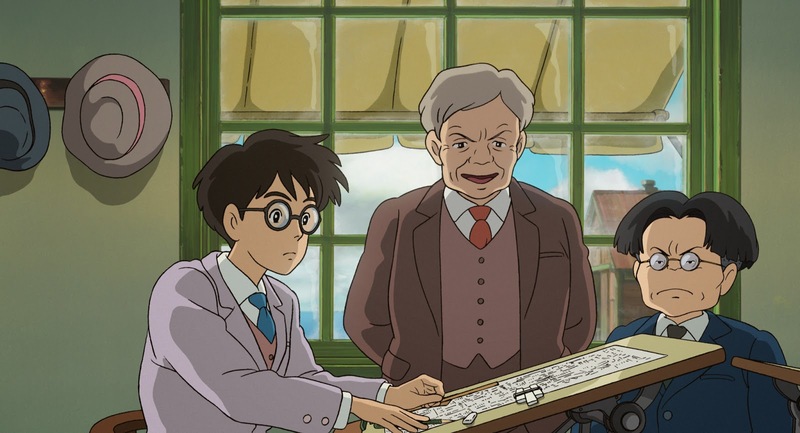 We meet Jiro Horikoshi in 1918, when he is a boy living in a small Japanese town. He dreams of flying through the air from his roof, dressed like an aviator and on a plane that resembles a bird. While flying, he is attacked by an ominous ship that emerges from the clouds and destroys his aircraft. Plummeting to the ground, Jiro awakens with a resolve to study Western aviation techniques. Later, Jiro has another dream, in which he meets an Italian aircraft designer, Gianni Caproni. It turns out that Caproni also is in his own dream, and he realizes that he and Jiro have the same aviation aspirations. Caproni confides that he took up aircraft design because his eyesight prevented him from becoming a pilot, and that “Airplanes are not for war or making money. Airplanes are beautiful dreams.” When Jiro awakens from this dream and thinks about his own weak eyesight, he realizes that he, too, has found his own career path. Jiro goes on to university, where he studies engineering. He meets a pretty girl, Nahoko, while on a train. An earthquake (the Great Kanto Earthquake and fire of 1923) strikes, and Nahoko's maid breaks her leg. Jiro assumes responsibility and gets the two women safely to Nahoko's family, but then disappears without a trace. He continues his studies, always with Caproni a guiding presence to encourage him. After graduation, Jiro hires on at an aircraft manufacturer, Mitsubishi, to design fighters for the military. Unfortunately, the first project is a failure and the company does not win a contract. 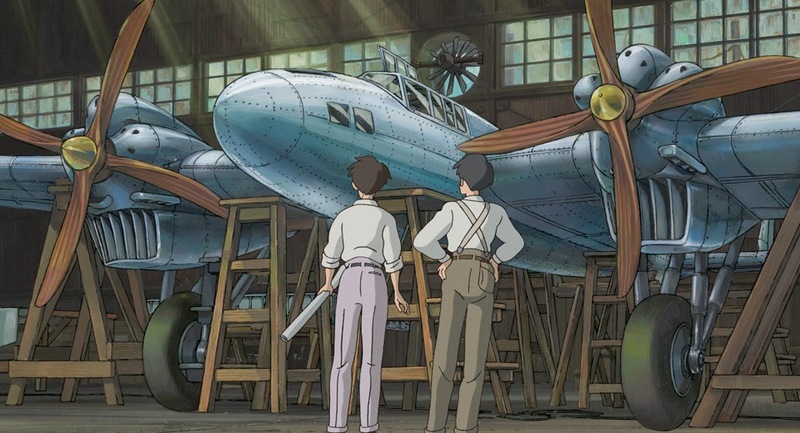 To develop Jiro and have him learn new techniques, the company sends him to Germany to study their cutting edge Junkers aircraft. While there, Jiro witnesses some of the brutal excesses of the German Third Reich regime and begins to question the ultimate results of his labors, which heretofore he has studiously avoided doing. Caproni returns to his thoughts, asking him whether he truly is committed to building things of wonder and beauty. Jiro concludes that he is. Jiro returns to Japan and becomes the lead designer at his company. Again, his fighter design is rejected, and he retreats, wounded, to a summer resort. To his surprise, he again meets Nahoko. The two bond and become engaged, but there is a problem: Nahoko has tuberculosis and will not marry until she is cured. Meanwhile, a German man helps the couple find love before fleeing from the Japanese police for being anti-Hitler. Another military project comes along (there were a lot of them in Japan in those days), this time for the Navy. Jiro bears down while Nahoko goes to a Swiss sanatorium to try and heal. While there, she realizes how much she loves Jiro, and returns to marry him. Jiro's sister warns that Nahoko will never recover and only sadness awaits, but Jiro resolves to live each day as if it will be their last and enjoy them with Nahoko no matter what happens. The happily married couple moves forward despite Nahoko's steadily declining health, and Jiro finishes his latest plane design, the Mitsubishi A5M. On the day of the prototype's test flight, Nahoko, in poor condition, goes out for a walk, having left behind three letters for Jiro, her family and her friends. At the test site, Jiro feels a strange gust of wind as his plane enters the competition, a wind that he instinctively knows is from his dear wife moving on. The final scene, almost an epilogue, is another dream. A war has been waged and lost, and Jiro's beautiful inventions have been used to kill and destroy rather than help people. Still, even in destruction they are things of beauty, if woefully mis-used, and Caproni appears in the dream to console him with the thought that Jiro did indeed scale the heights of design. Nahoko appears also to let him know that she will always be with Jiro and that he must move on past the horrors that life has bestowed. The "The Wind Rises" is an extremely personal and adult film, full of nuance and with an unyielding focus on Jiro, the boy with a dream grown into a man. The extremely brutal and malevolent purposes to which his creations are put are acknowledged, but this is a coming-of-age film that shows the realization of a dream from beginning to bitter end. We see a fully realized success that later becomes known as tragic and pyrrhic, but the achievement is portrayed in very personal terms to be the culmination of perseverance and compliance with a good-hearted, if perhaps ultimately misguided, inner ethos. We are accustomed to thinking of animation as something for children - "The Wind Rises" has nothing in common with "The Flintstones." 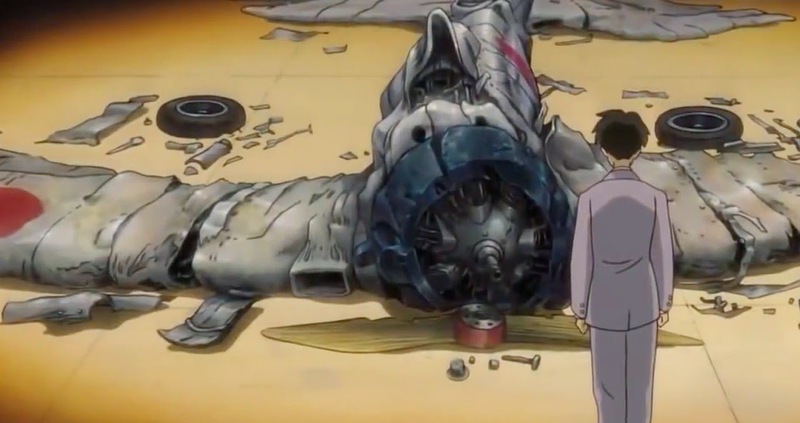 Miyazaki's father actually worked at a parts supplier for the Zero fighter, which was the successor aircraft (and the true epitome of Jiro's monstrous creativity) to the final fighter prototype shown in "The Wind Rises." It is easy to read into this story a covert homage to Miyazaki's own father and roots, a return to the shattered dreams of his childhood and the hopeful people of that time at the end of Miyazaki's career that itself mirrors the dreamlike symmetry of "The Wind Rises." Treading a very fine line between glorifying weapons of death and violence and honoring a genius, the film is extremely careful to portray Jiro as a simple dreamer who abhors the mistreatment of others and only wants to create a wonder for the world's benefit and admiration. The Zero fighter certainly was beautiful as long as it wasn't firing its main guns at you, and was for a time among the best in the world. 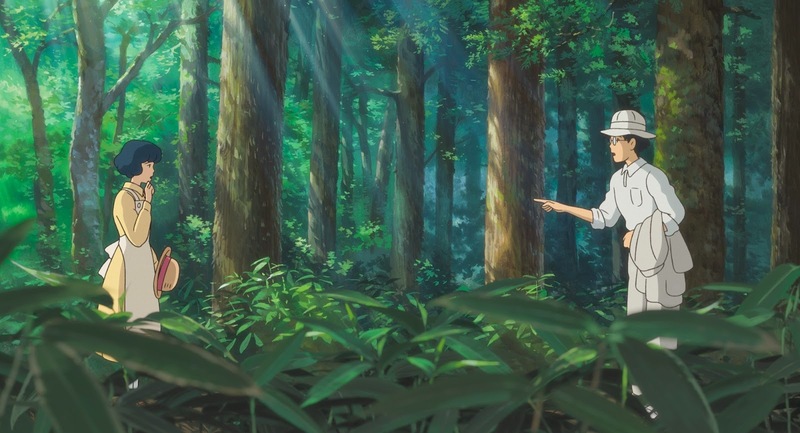 For a boy to realize this kind of dream anywhere in such a fashion is astonishingly rare, and another central theme of "The Wind Rises" is that this is a meditation on the compromises and tradeoffs required of a successful man. That may have been the most personal thing of all about this film by the legendary animator, Hayao Miyazaki. So, in fact there was no Caproni advising Jiro in his dreams (though Gianni Caproni is a real historical figure who founded the Italian aircraft industry, renowned for its elegant planes) and there was no real Nahoko: they are metaphors for both the essential purity of Jiro's work, the real impetus behind his designs and the unavoidable death of his innocence. They are the guiding angels on Horikoshi's shoulders, angels which cannot fend off the carnage that awaits. The question inevitably arises as to whether the life of the designer of an airplane whose sole purpose was to kill people and which inadvertently contributed to a nation's ruin is a fitting subject for an animated film. That is unanswerable except by each person individually. It is necessary to tune out the politics and the history to suspend your disbelief, and many people appear unable to do that. 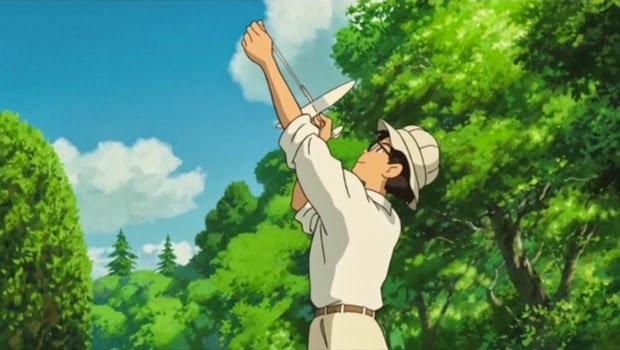 There is no need to watch "The Wind Rises" if the politics are too raw and the ends - a death-dealing machine - in your mind outweigh the means - an inoffensive engineer doing his job with math tables and slide rule and calipers. It is difficult to work up any sympathy for people who go to see a film about a subject that is inherently objectionable to them. The film simply presents a look at a man's achievements, for good or bad, from his own perspective, and nobody is requiring you to accept his viewpoint or deny his complicity in later events. Even amongst the catastrophes shown, the film implies, there were nuggets of truth and genius intermingled with the bitter fruits of man's inhumanity and failure. 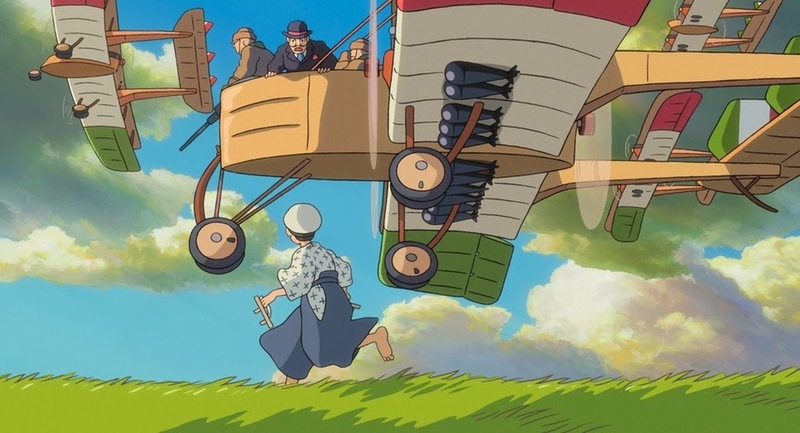 I will admit that the picture drawn in "The Wind Rises" is slanted very heavily in one direction, and one surmises that there was a little more ambiguity and less sheer blamelessness to Horikoshi than what we are shown. 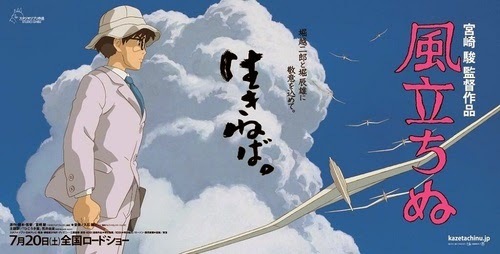 But "The Wind Rises" appears intended to say, "this is a man, and he did special things that benefited him and cost him greatly as is the case with all humans," and it achieves that goal. 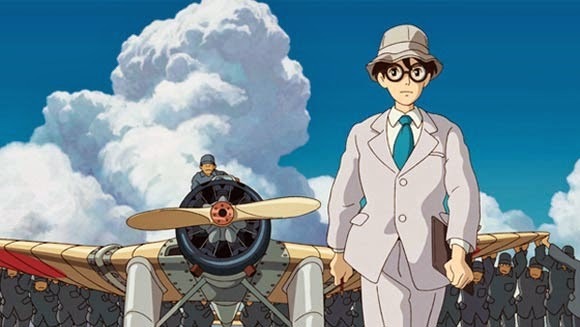 In the English dub version, Joseph Gordon-Levitt voices Jiro, Emily Blunt is Nahoko, and Stanley Tucci gives life to Caproni. Also in the cast in supporting roles are Martin Short, Werner Herzog, William H. Macy, Mandy Patinkin and Jennifer Grey. 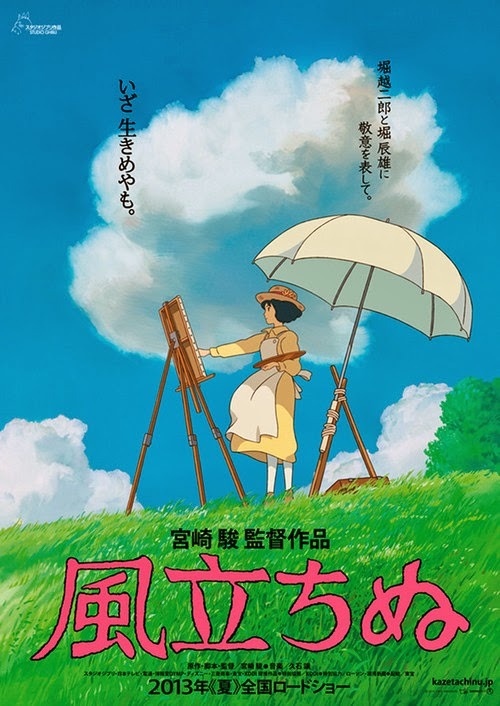 "The Wind Rises" became the highest grossing 2013 film in Japan, but engendered - as Miyazaki no doubt expected - political attacks from every angle. This, in fact, may have contributed to his decision to make this his last film before retirement. The film has won awards around the world, including an Annie to Hayao Miyazaki for Writing in an Animated Feature Production, beating out among others Disney's "Frozen." 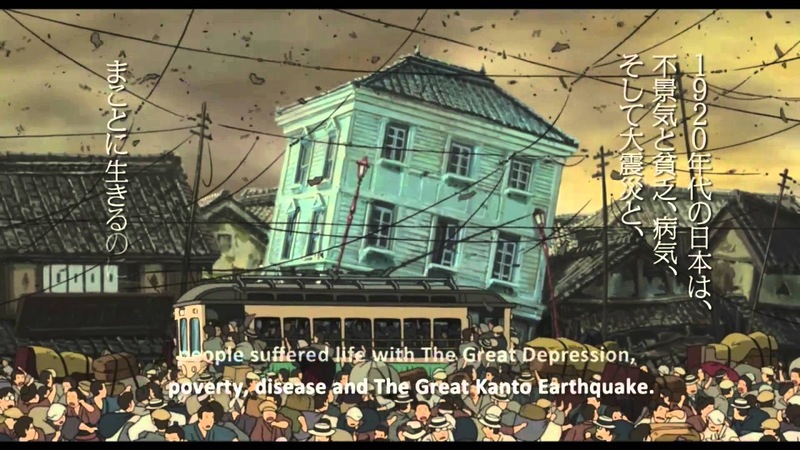 The hand-drawn animation is exactly what you would expect from Studio Ghibli, exquisite, particularly during the dream and earthquake sequences. Nature is drawn in intoxicating fashion, with light and shadow creating a wonderland of color. The precision of the animation is phenomenal. Below is a trailer with English subtitles, released for the film's international past debut at the Toronto Film Festival. 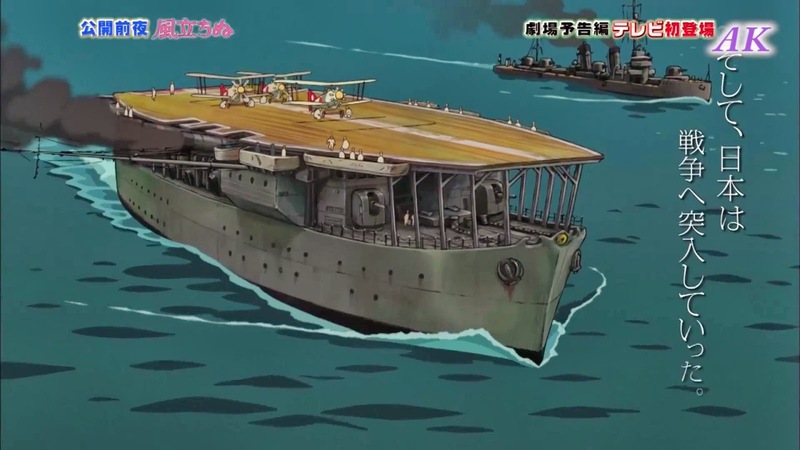 Below are trailers for "The Wind Rises" which are not in English, but still give a good feel for the film and are enjoyable. Chris Buck and Jennifer Lee Discuss "Frozen"
The Incredibles in 3D - Here it Comes!